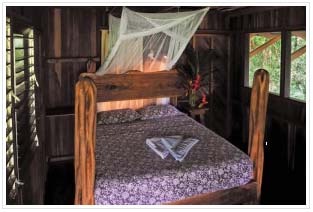 Encanta La Vida is an unique jungle lodge located in the tropical rainforest of Southern Costa Rica. Situated on the tip of the remote and exotic Osa Peninsula, our beachfront Lodge in Cabo Matapalo offers adventurers the opportunity to witness one of the few untouched pristine regions in the country. Experience the sounds of the jungle, sunbathe on breathtaking beaches and see amazing wildlife all in one location. 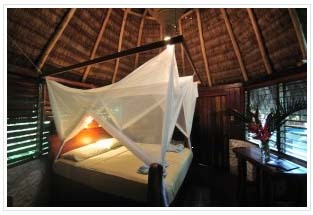 Encanta La Vida is a jungle lodge located on the tip of the Osa Peninsula in Cabo Matapalo. It is surrounded by tropical rainforest with a corridor of forestry reserve connecting to the Corcovado National Park. 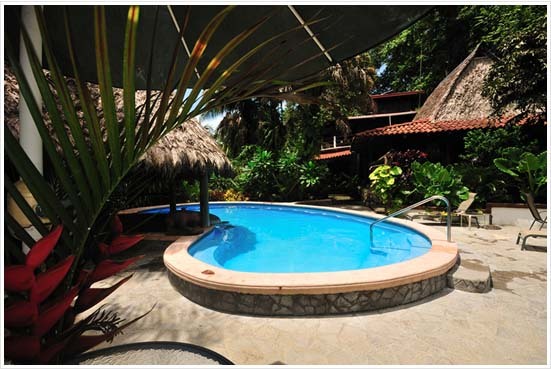 We are proud to have been the first hotel established in this exotic part of Costa Rica. We remain committed to providing unique and adventurous travel options in the comfort of an intimate, beautiful tropical jungle lodge. Enjoy a remote jungle vacation with all the amenities you need to ensure an unforgettable get away. 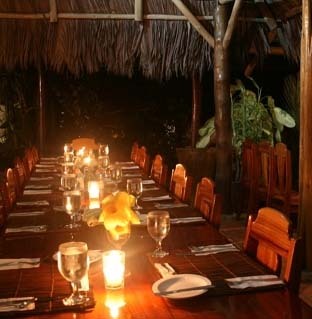 All meals are served in our open-air thatched roof dining area. You have your choice of romantic dining on the lower level or family-style seating in the dining room. Our chef will delight your palate with delicious meals and tropical beverages. All of our meals are crafted with the freshest local ingredients. In the morning coffee and tea are ready around 6:30am and are available throughout the day. Breakfast is served from 8am until 9:30am, lunch is from 1pm until 2:30pm and dinner is served at 6:30pm. Relax at our poolside full-service bar after a day of exploring the rainforest. The large pool deck is equipped with lounge chairs and umbrella covered tables and chairs. 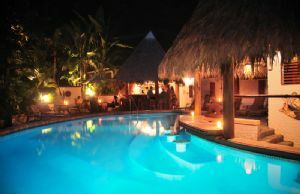 The pool has a swim up bar where you can enjoy cocktails made with fresh local fruit or an ice cold beer, known as an ‘Alaska’ by the locals. We also have a variety of non-alcoholic fruit juices, smoothies and sodas. Encanta la Vida offers five different accommodations with a total of 9 rooms to choose from. Each cabina is unique in it’s own, and equally enchanting. All of the rooms have quality mattresses, mosquito netting, reading lights, fans for the bed and ample outdoor patio space. Read the brief descriptions to see which room best suits you. The Casona is a three-story structure centrally located near the dinning area and pool. 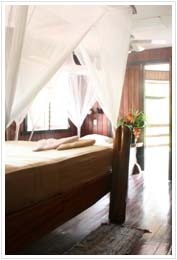 You can watch toucans and monkeys right from the large veranda that is equipped with rocking chairs and hammocks. It is beautifully constructed of exotic woods, mosaic tile detail and decorated with local art and indigenous artifacts. There are two rooms in the Casona. The Ranchito Room is a ‘typical’ thatched roof structure made from local exotic hardwoods, complete with a private deck and rocking chairs. It is backed by the jungle and has views of the property and gardens. This private cabina offers comfortable breezy accommodations with one queen bed, private bathroom, hot water and a private patio. The Pole House is a rustic three-story structure made of exotic hardwoods, surrounded by tropical gardens and provides comfortable outdoor living space. People often relate it to the Swiss Famliy Robinson House or a tree house. All accommodations share an outside bungalow shower. Our most spacious and newest cabins, each suite has a private entrance and large private patios. The cabin is very private, tucked into the forest and surrounded by gardens. The rooms are large enough for the whole family. These rooms can be accessed by their own private driveway. This luxurious mini villa is very spacious and was designed with privacy and comfort in mind. 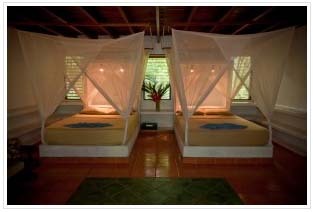 The Honeymoon Cabina is surrounded by tropical gardens. It’s about 700 sq ft with rear and front decks, which have hammocks and chairs. There is also a beautiful large tiled bathroom with hot water, one queen bed and one single bed. Not just for honeymooners, this cabin is perfect for families as well. *Price includes: accommodations, 3 daily meals, daily maid service and taxes. Now let’s focus on Yoga. At Encanta la Vida we offer a variety of Yoga services. Practice Yoga individually anytime or with a class on our beautiful ocean view Yoga Deck. Also enjoy our Spa treatments as part of our Yoga Retreat packages. Encanta La Vida facilitates numerous yoga retreats every year. We offer our entire lodge to instructors for groups of 20 or more participants. 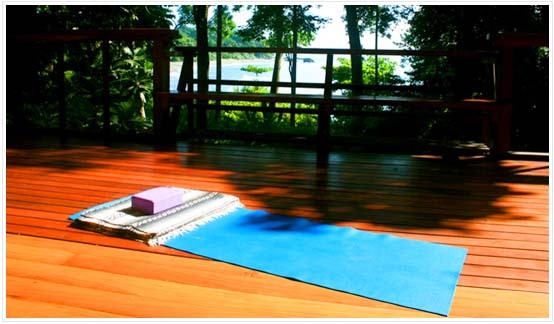 Our two-story 36 x 33 foot yoga deck is located at the beach under the rainforest canopy and overlooks the crystal blue waters of the “Golfo Dulce,” the ideal place for a unique yoga experience. Why Encanta La Vida? Location is key! What makes Encanta La Vida the best place for a yoga retreat is not only the quality of service we provide or the beautiful lodge itself but our great location. Our lodge is nestled between the mountains and shore of Cabo Matapalo where the secondary forest meets the primary forest. Matapalo is known as the epicenter for flora and fauna in the area. Four species of monkeys, toucans and scarlet macaws are seen from our lodge and yoga deck regularly. We are the only lodge at the beach in Matapalo, considered by many as the most exclusive area on the Osa. We are also fortunate to have the best beaches for swimming, sunbathing and surfing are right in front of our property! The Encanta la Vida Spa located at the yoga pavilion was specially designed for yoga retreats. The lower level has two separate areas where you can enjoy spa treatment, acupuncture and massage. Travel arrangements to the capital city of San Jose can be made with major airlines including American Airlines, Continental and Taca. It is a 7 to 9 hour drive or a 45 minute flight from San Jose to Puerto Jimenez, the town closest to Encanta la Vida. If you choose to fly, the easiest way to book is with our reservation link below. We can coordinate the best transportation for you depending on your arrival, baggage requirements, and overall travel plans within Costa Rica. Once in Puerto Jimenez, our agent Isabel can arrange for a taxi to pick you up at the airport for the 40 minute transfer to the Lodge. The quickest way to get to Encanta la Vida is by air. Although several airlines offer service we highly recommend Sansa Airlines. You can check out their scheduled flights and buy tickets online by clicking on the link below. Sansa flies directly from the international airport in San Jose to Puerto Jimenez.